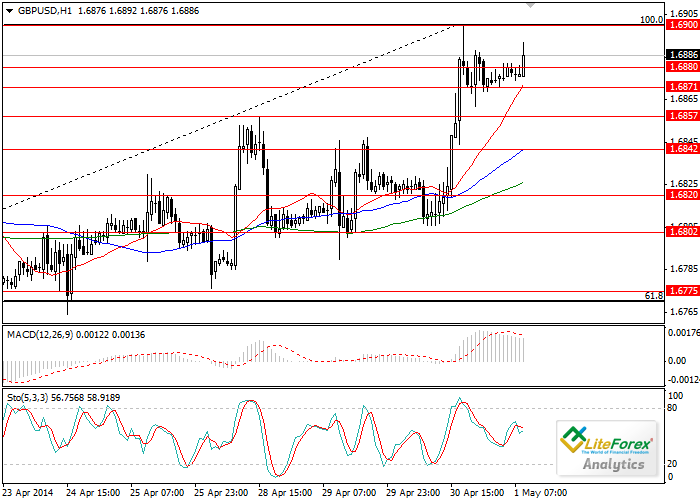 On Thursday the pair GBP/USD was volatile although some of the markets were closed because of the Labour Day. Purchasing managers PMI in the manufacturing sector of the UK was above the forecast, which promoted the rise in the pair above the level of 1.6900. However, in the afternoon the Pound fell to the level of 1.6880. Later the pair tried to break down the level of 1.6900, but failed. Today, PMI in the construction sector of Great Britain became known. The data has slightly weakened the pair, but pressure on the Pound has not been strong. Investors are waiting for the data on number of jobs outside agricultural sector in the USA. Experts’ forecast is positive, and if it proves to be true, the pair will weaken for a short time, which will provide a good chance for opening long positions. The nearest and the most important resistance level is 1.6900 – psychologically important level, break down of this level will allow the Pound to rise to h\the higher levels. Long positions can be opened after consolidation of the price above the level of 1.6900. Limited buy orders can be placed at the level of 1.6840.